New York, NY – February 6, 2018 – Researchers at Tisch MS Research Center of New York (Tisch MSRCNY) have shown a stem cell-based treatment may reverse disability in progressive multiple sclerosis (MS). 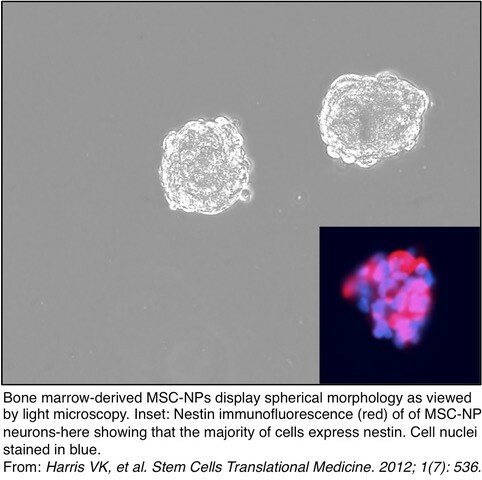 Results of the study add to the existing evidence demonstrating the safety and tolerability of intrathecal (injected into the spinal canal) administration of autologous mesenchymal stem cell-derived neural progenitors (MSC-NPs). The study has been published in EBioMedicine, a partnership between Cell Press and The Lancet. MS is an immune-mediated demyelinating disease of the central nervous system and is one of the leading causes of disability in young adults. Cell therapy is emerging as a therapeutic strategy to promote repair and regeneration in patients with disability associated with progressive MS.
“The results from our study justify the initiation of a planned FDA-approved Phase II trial in a larger group of patients,” said Dr. Saud A. Sadiq, Director and Chief Research Scientist at Tisch MSRCNY. “We anticipate that these novel studies may form the therapeutic basis of reversing disability in patients with MS and if successful, these studies could have positive implications for treating other neurological diseases,” he added. In the post-treatment efficacy analysis, study participants demonstrated a reversal of disability as determined by improved median expanded disability status scale (EDSS). In addition, of the 20 subjects, 70% had greater muscle strength and 50% exhibited improved bladder function. “Our study was uniquely associated with repeated administrations of fresh, not cryopreserved cells, which may have contributed to the observed efficacy of the treatment,” said Dr. Violaine Harris, Senior Research Scientist at Tisch MSRCNY. “The protocol we created allowed for delivery of these stem cells within thirty minutes of harvesting the cells,” she stated. This stem cell research has been conducted by Dr. Sadiq and his team since 2001. The study entitled, “Phase I Trial of Intrathecal Mesenchymal Stem Cell-Derived Neural Progenitors in Progressive Multiple Sclerosis,” was a culmination of over a decade of work. As a result of these promising developments, the FDA-approved Phase II study will commence to establish efficacy. Tisch MSRCNY has invested $5 million to build a new Regenerative Medicine Laboratory where all aspects of this innovative research and treatment will take place. Tisch MS Research Center of New York is an independent nonprofit 501(c)(3) organization dedicated to finding the cause and a cure for multiple sclerosis by conducting groundbreaking medical research to accelerate the pace at which research discoveries translate from lab bench to bedside. The Center aims to identify the cause of MS, understand disease mechanism, optimize therapies, and repair the damage caused by MS while offering patient access to the best and most advanced treatment possible.